Q: When will construction finished? A: The contract say June of 2019, however the weather has not been cooperating. Q: Will there be library services during construction? A: The library will be required to provide services during the construction. The Monterey Fire Company has agreed to let us use their classroom for the duration of the project. Visit us at the fire station, 411 Main Road. Q: Will the construction affect the interlibrary loan services? A: The library will provide the same CWMARS, and COMCAT services during the construction. Q: How about the public WIFI? A: The library has kept the wifi going on the center of the village as well as running another wifi in the Fire Station. The center of town Monterey Library Guest requires no password. The Fire Station network has a network that requires the password ILikeToRead. Q: Is there a place for the Knox Gallery in the new library? A: The original, main part of the existing building will become the multipurpose room and serve the functions the Knox Gallery has for the last few years. It will be 50% bigger, and will have access to both bathrooms and a kitchenette along with easily accessible chairs and tables. The Gallery has been a big part of the library and we are committed to making it part of the new library. Q: Will the Library be LEEDS certified? A: There is an incentive grant of $100,000 in the state grant which will help cover the costs of obtaining this certification. Q: Is the library looking for funding other than through local tax dollars? 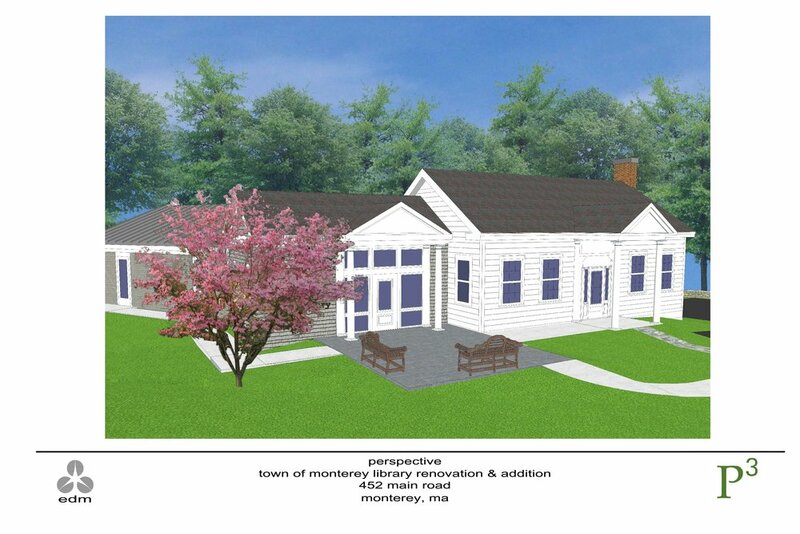 A: The Friends of the Monterey Library have been supporting this project through the winter of 2017-18 with privately raised money. The library and the Friends will continue to look into other sources of funding. The Friends of the Library has committed much of the money it has raised thus far to the contingency fund for the project budget which exceeded the projected budget by $80,000. The Friends will continue to raise whatever private monies it can to provide furniture, landscaping and other items not covered by the grants. Please consider a donation to help complete this project! Q: What is the financial status of the project? As of December 2018 the Massachusetts Board of Library Commissioners has voted to award the first three payments of the grant. The first was for signing the contract. The second came after we submitted 90% construction drawings. The third payment came after we received a building permit. The MBLC had the right to award those payments over three years so we feel very fortunate that we got all three in the time frame of six months. That means up to this point the town has not had to borrow any money. Payment number four comes after a Certificate of Occupancy has been issued, which will not be until next summer. Payment five is after paper work requirements have been met and can be up to a year after payment four. At some point this winter the town will have to borrow the remaining money for the project, some of which will be paid back after payments four and five. We also hope to achieve LEEDS certification and earn a $100,000 award for that. It is important to note that due to interest rate changes and timing of the project milestones it is not easy to project how much it will cost the tax payers. As time goes by, the figures will be more clear for the loan. If we achieve the LEEDS award the Town of Monterey will borrow 1.145 million to be paid over 15 years. There will be a period of time, however, when the town will have borrowed about 2 million in order to pay the bills until the rest of the grant money is received. 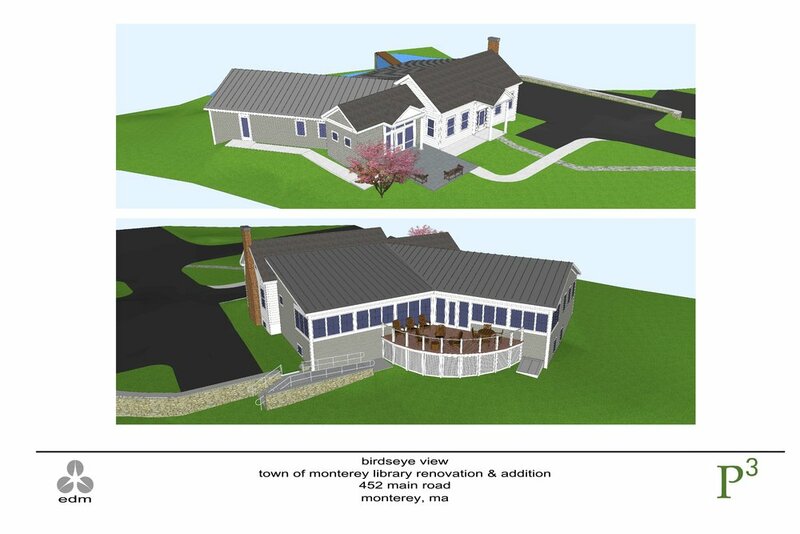 Throughout this process we have sought out what the people who live in Monterey want, and we have presented you with a library design that answers the needs of the town. We have been working on the best way to fund this project and are presenting you with a plan that will minimize the impact on the tax rate. We thank you for your support thus far in allowing us to apply for the state grant and approving warrant articles that made it possible for this to happen!